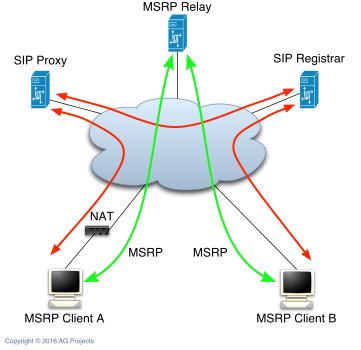 MSRP Relay is a relay to help NAT traversal of MSRP based Instant Messaging and File Transfer sessions between SIP end-points located behind NAT. This extension is defined in RFC 4976 This software is licensed according to the GPL version 2. A series of related instant messages between two or more parties can be viewed as part of a "message session", that is, a conversational exchange of messages with a definite beginning and end. This is in contrast to individual messages each sent independently. Messaging schemes that track only individual messages can be described as "page-mode" messaging, whereas messaging that is part of a "session" with a definite start and end is called "session-mode" messaging. Page-mode messaging is enabled in SIP via the SIP MESSAGE method, as defined in RFC 3428. Session-mode messaging has a number of benefits over page-mode messaging, however, such as explicit rendezvous, tighter integration with other media-types, direct client-to-client operation, and brokered privacy and security. Message Session Relay Protocol (MSRP) is a protocol for transmitting a series of related instant messages in the context of a session. Message sessions are treated like any other media stream when set up via a rendezvous or session creation protocol such as the Session Initiation Protocol (SIP). MSRP Sessions are defined in RFC 4975.